Looking for your next Aqua Marina Paddle Board? Well look no further bro’s and broettes because we went ahead and did all the research for you in this massive review post. This inflatable unit is highly recommendable for lighter riders since it is thinner than the BEAST. It’s great for people who would like to go paddle boarding for exercise since it is lightweight, easily portable, and can be faster on the water. We recommend one of the newest additions to the Aqua Marina inflatable SUP collection for water sports fans who would like to enjoy leisurely paddling over still water or a few sessions of SUP yoga over the weekend. This inflatable model is an all-around board with great rigidity and versatility. This is a shorter paddle board from ​them that comes with the new dual stinger technology. With multiple grab handles on the board and a raised kick tail, this paddleboard is great for surfing and paddle boarding practice. If you have a little bit more experience with surfing and paddle boarding than the average novice, then you may want to consider getting the ​MAGMA. This board is one of the top options for cruising and surfing moderate waves since it is designed with performance as the top priority. This ​stand up paddle board is named as such due to its gigantic size. With dimensions measuring up 18’1″ long and 76 pounds heavy, this paddleboard can carry up to seven people. It’s a great way to bond with your friends and family on the water while also getting a lot of exercise for everyone. On the shorter side, this particular paddle board is an all-around inflatable SUP that is recommended for people with smaller body types. It is lightweight, easy to carry, has good rigidity, and most importantly, this board is highly durable. Are you looking for a paddle board for all-around cruising? This model is an inflatable WindSUP paddle board that is great for both leisurely paddling and fitness paddling. Aside from that, this product comes with a sail, mast, sports boom, mast base, an alloy extension–basically all of the things you would need to use the board for windsurfing. People who are lightweight can benefit from using this paddleboard since it is lightweight itself, offering great stability and support for riders who want to use the board for fitness paddling and leisurely paddling. Moreover, the​ BREEZE comes with a versatile shape for all-around paddling, as well as a removable tri-fin configuration for improved adaptability. This paddleboard falls in the medium length category and also has a moderate weight of 21 pounds. It is a highly versatile product which means that it can be used for fitness paddling, recreational paddling, flat water cruising, and SUP yoga among other fun activities. Here’s a product for riders with a heavier set body or a larger body type. 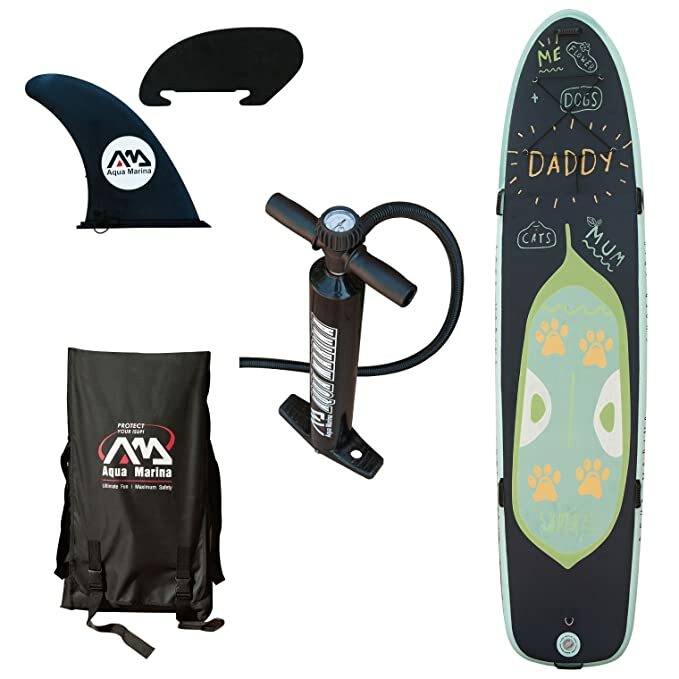 The Aqua ​MONSTERcan support the weight of a heavier person while letting him or her enjoys the fun that an all-around paddle board has to offer. Due to its high versatility, we recommend the MONSTERmodel for both beginners and experienced paddlers. Furthermore, riders looking for the ultimate stability will benefit from the ​MONSTER. The ​MONSTER model is not only stable for larger riders but can offer more experience in varied conditions as well. If you are looking for a product that is perfect for beginners, the Perspective model is recommended for you. People who are just starting out paddleboarding are often having difficulty with balancing on the board. With the Perspective’s independent side chambers, floating will make it easier than regular paddle boards. Another perfect option for beginners, kids, and novice riders is the VAPOR– a board with three removable fins, a wider body, and lightweight material. Just like the Aqua Marina MONSTER, the VAPOR is a versatile SUP which can make water sports ten times more fun. Aside from its eye-catching design, what made us recommend this model is because of its lightweight material, single fin design, a mid carry handle, and a special storage area on the board itself. This model is recommended for people who want to use the paddle board for both relaxation and competition practice. Does bigger always mean better? With the ​Super Trip paddleboard, you can enjoy a leisurely stroll on a peaceful lake with your friends and family since this board can support up to two people. Other notable features of this special paddle board are the EVA foam traction pad, grab handles and versatile trio-fin setup. A board on the longer side, the Race is the only SUP paddle board that is specifically designed for paddleboard racing. With a sleek and narrow design, this excellent paddleboard allows a rider to paddle fast and for long distances, but with less stability as expected from narrower boards. If you’re an experienced paddle boarder looking to get a performance-oriented board, the Race may be your best bet. This Aqua Marina SUP is on the wider side, made for people who want an affordable and easily portable fishing vehicle. Due to its dimensions and design, this paddleboard is very stable on top of the water, and a rider can easily balance himself on it while waiting for a catch. Moreover, this model features a high back seat, built-in rod holders and bait well, and a removable fin. We have another model on this list that can let you enjoy the waves and the wind. The Aqua Marina Champion is an inflatable windsurf SUP complete with a mast, boom, and sail. This convertible rig is highly recommended for people who would love to have a paddleboard that can be used as both a SUP and a windsurf board. To start, let’s go over the most important factors and features that you need to look into before choosing a new paddleboard. Don’t Pick The Wrong Hull! There are two types of hulls when it comes to paddle boards: a planing hull and a displacement hull. Your choice will depend on what type of paddling you are planning to do on your next trip to the beach or the lake. For people who would prefer casual or leisurely paddling, a planing hull paddle board is recommended for you. It is also great for SUP yoga, relaxation paddling, and whitewater because of its wide body and easy maneuverability. On the other hand, a paddleboard with a displacement hull is perfect for people looking to do fitness or competitive paddling due to the board’s narrower body and nose, which can allow for a faster speed. This factor will depend on the paddle board’s weight capacity. Don’t worry, and you can easily look up the weight capacity on their website. Stand-up paddle boards or SUPs have two kinds of construction styles, namely: solid and inflatable. A solid paddle board is typically made out of a foam core that is surrounded by a solid surface like fiberglass and epoxy. Solid paddle boards are used when the stability, durability, and performance of the board are your main preferences. Meanwhile, an inflatable paddle board is recommended for people who prefer easy storage, portability, and leisurely paddling. This type of paddle board is usually constructed from PVC exteriors with an air core, making it softer than solid boards and perfect for leisure and yoga. The length of a stand-up paddleboard can be divided into three categories which are short, medium, and long. Short paddle boards are usually under 10 feet, making it great for surfing waves and for children to use. Medium length paddleboards, which are 10 to 12 feet long, are typically used for usual paddleboarding and SUP yoga. Lastly, long paddle boards that are more than 12 feet are recommended for faster and long-distance paddling, just like in competitive paddle boarding. Aside from length, another dimension to look into is the width of the paddle board. A paddle board that has more width is generally more stable while on the water but is slower and more difficult to paddle. On the other hand, a paddleboard that is narrower will be faster on the water but is less stable. Your choice of width should also depend on your body type, whereas smaller people will find a better balance on a narrow board, and the same for bigger people on a wider board. It’s a highly established company that produces some of the best watersports gear on the market. In terms of their paddle boards, the quality and valuable features of their products make them one of the best producers. Currently, they makes paddle boards that are great for people of all ages and experience levels. Paddleboarding, an exciting modernized water sport with a lot of enthusiasts around the world, is also a great way to get exercise and recreation. With this in-depth Aqua Marina paddle board review, we hope you get a better idea on which gear will suit your needs best.